I have another recipe for you. An excellent recipe, I might add. This is not a new one to us, however. I've been making this for about 5 years now. I was first introduced to Brunswick Stew at our local Mennonite Relief Sale where each year they make a huge, steaming vat of it. The vat is so big that they stir it with a canoe paddle. It's so good that the line to buy the stew is always long, long, long. It's also so good that in the past Jamey and I have been known to buy 5, 6 or 7 quarts at a time. It's for a good cause and it's instant dinner. We liked it so much that I got to thinking about how I might make my own so we don't have to wait for the yearly relief sale. I went on a quest and I found a recipe that isn't exactly the same, but it's equally as delicious. And, possibly even more so. 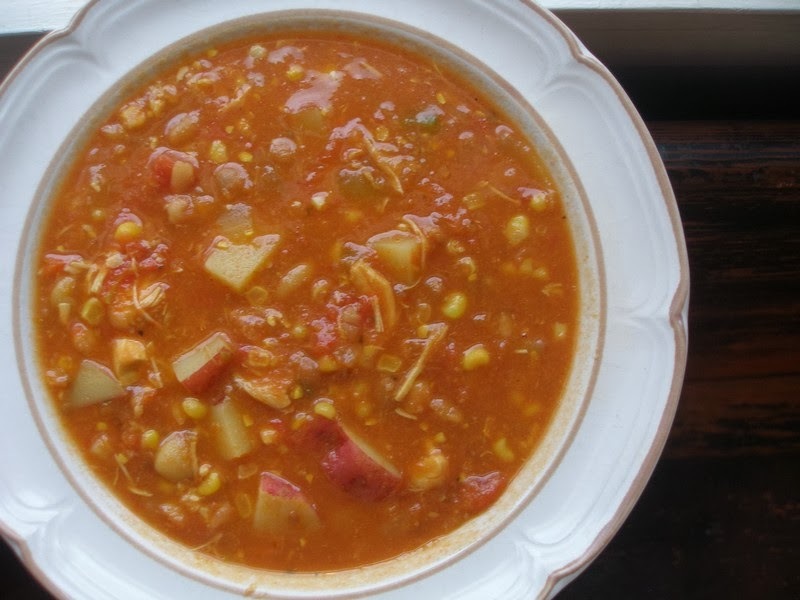 My Food Lover's Companion says that Brunswick Stew is named after Brunswick County, Virginia, which was the birthplace of this "hearty squirrel-meat and onion stew". It goes on to say that the modern version more often contains chicken and vegetables including corn, tomatoes, okra, and lima beans. What this definition leaves out is that this stew is packed with flavor- or at least this recipe is. It's not your standard meat and potato stew. Scan down the list of ingredients and you'll see. The flavor sings. And does not include squirrel-meat. I apologize if that is disappointing to you. Serves 8-10 and freezes nicely. Cook chicken in a large cooking pot covered in boiling water until done. Remove chicken from broth, cool slightly, then skin, bone and chop chicken into bite-sized pieces. Set aside. Save or discard broth. Yum I will have to try this....I have vegetable beef soup cooking now but this sounds really good too! Do you know how this would work with beef? We don't eat poultry as my husband is allergic to it. Personally I like to keep him breathing! Do you actually use canned baked beans? What would you recommend as a substitute? I was just trying to come up with a soup/stew idea. Thanks! I've never tried it with beef, but I can't imagine it wouldn't be good. Yes, I use store-bought canned baked beans. You could certainly make your own, though. I've never tried since this is the only time we ever use baked beans. This looks really yummy, I will be trying it soon. I work late at the office and it's so nice to have a soup ready when I get home, tired and starving! And I always thought brunswick stew was rabbit. I'd much prefer chicken anyway and this sounds yummy. I love a good stew in the winter! I actually saw a squirrel in my cousin's cookpot one time. Looked terrible. And I'm not sure what he was aiming to make with it, but probably not something delicious like your Brunswick stew! JJ, why couldn't you just use leftover baked beans, or failing that, some cooked beans with a bit of ketchup, mustard, brown sugar? I'm going to try this recipe - thanks. Some of the older members of our family do hunt squirrel for food. My husband has 2 bachelor uncles that do and we have visited them and been served squirrel in a stew with dumplings. They seem to add bacon to the dishes that have squirrel I have noticed. They always serve borscht at the Menn. Relief Sales around here. I was going to make a soup soup this evening so I think I will try this recipe, using some homemade baked beans from the freezer.